Capt. Richard Silva of the WILD BUNCH discovered this monster blue nearly 20 miles off Kahana Bay on Oahu's Windward Coast. 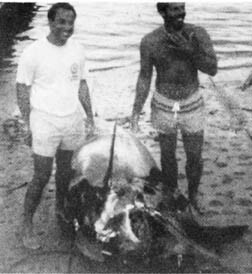 Gary Silva fought the fish for two hours before landing Kaneohe's largest marlin to that date.